With unemployment at a 17-year low, restaurants are struggling to hire and retain workers. One fast-food CEO says that labour shortages is the industry’s biggest challenge in 2018, an opinion backed by a new UBS report. Chains with lower employee satisfaction ratings are especially at risk, including Wendy’s, KFC, McDonald’s, and Chipotle. As unemployment drops, restaurant chains are facing a new crisis. US unemployment has fallen to a 17-year low, reaching 4.1%. However, the shrinking distance to full employment means that many fast-food chains are struggling to hire and retain workers – especially those who would rather be working elsewhere. Dunkin’ Doughnuts CEO Nigel Travis said that labour shortages and the battle to hire and retain workers is the biggest problem facing the fast-food industry in 2018. “One franchisee always quotes, ‘I can only get 60% of the labour I need,'” Travis told Business Insider. Rising minimum wages and a tight labour market mean that “labour is one of the most significant headwinds” for the restaurant industry in 2018, according to a report by UBS analyst Dennis Geiger released on Tuesday. Lower unemployment can make retaining employees and hiring people who are well-suited for the job more difficult. Boosting employee satisfaction rate “can lead to higher retention, better customer service and contribution to” same-stores sales, Geiger writes. In tight labour market, brands with lower employee satisfaction rates are especially at risk. Employee satisfaction, as measured by UBS Evidence Lab’s analysis of Glassdoor data, found Wendy’s, Sonic, and KFC had the lowest employee satisfaction ratings in 2017. McDonald’s and Dunkin’ Brands were also poorly rated. Year-over-year satisfaction dropped the most at Wendy’s, Chipotle, Sonic, and McDonald’s in 2017. The most obvious solution to boosting satisfaction is to increase wages. Geiger writes that the lowest-paying restaurant chains “may need to implement larger increases to recruit and retain employees,” as they are less competitive than others in the industry. Wages are already increasing across the industry, with average pay increasing 1.5% across the industry according to UBS’s analysis of Glassdoor data. Eighteen states raised minimum wage in 2018. Further, Geiger notes, retailers such as Target and Walmart’s decisions to raise minimum wage for all workers puts increased pressure on the restaurant industry if they want to win over workers in a tight labour market. Pay isn’t everything. 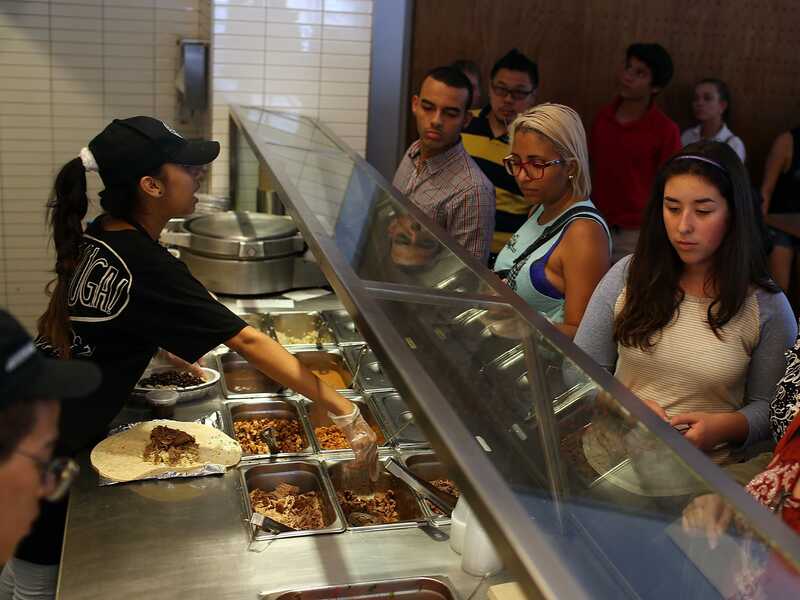 Overall employee satisfaction at Chipotle, for example, dropped 3% despite the chain increasing wages at a higher rate than most the chains surveyed by UBS. However, overall pay is a relatively strong indicator of employee satisfaction. Starbucks, the chain with the highest average pay, has an employee satisfaction ranking of nearly 30% above its competitors. The chain has made significant investments in worker pay and benefits – something that other restaurant chains will need to consider if they want to survive the building restaurant labour crisis.